The press keeps rolling. 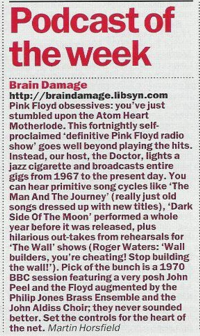 Brain Damaged listener, Martin Horsfield is also a writer for Time Out London. Martin wrote up a very nice 150 word column on for the magazine’s Radio page, podcast of the week. Time Out is a well known weekly magazine that contains information about events in film, theater, fashion, literature and all other artistic events happening in and around London since 1968. The lifestyle magazine also has outlets in New York City and Chicago as well as 10 other large metro areas around the world. This entry was posted in Press by Doc. Bookmark the permalink.